Aimée Baldwin is a self-taught sculptor and artist with diverse creative experience that spans manufactured Halloween costume prototyping to monument and park sculpture. Concerns about the environmental impact of the mass production of disposable items led her to the art she makes today. Aimée constructs incredibly realistic bird and plant sculptures from very simple materials: art-quality crepe paper, florist wire, white glue, and acrylic paint. She describes her artistic process as repetitive cutting and gluing with a lot of patient attention. Aimée gathers plant knowledge by studying live specimens collected during local hikes and says the only way she can depict a plant accurately "is to copy a fully dimensional real plant, and sometimes this includes taking it apart to understand all of its little bits. I use my work as an excuse to go on excursions to see wildlife and plants. I would go out hiking anyway, but hikes are more fun without the guilt that I would have if I were avoiding work." Sounds like a plan to me! 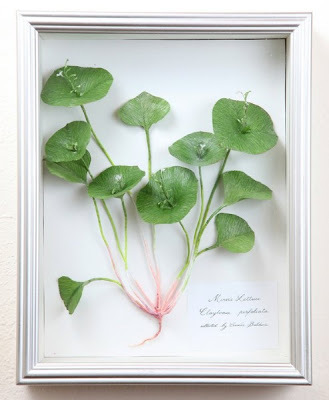 Miner's Lettuce, a San Francisco Bay area native plant, is exhibited in Aimée's current show, which runs through June 15th at Castle in the Air in Berkeley, California. See more examples of Aimée's plants and birds on her website, Vegan Taxidermy, as well as an interesting description of her additional artistic ventures. Reminder: The Fabulous Flowers Klutz book giveaway ends at the end of Saturday. Winners will be announced on that post on Sunday. wow...these look so so real ! Thanks for sharing this beautiful work with us Ann ! What a great artist! Her birds look so real . I especially liked her extinct birds. I checked out her website and was taken with the realism of her artwork. All accomplished with paper! Fantastic. wow! so amazing and realistic looking! Ooh I love her work, she should be proud. I was lucky enough to see her work in person yesterday, and WOW! The pictures do not do her work justice! It was amazing! Wish we could have met her, but just seeing her work was wonderful!Extremely life like! So so beautiful!